For many of us, freshly brewed coffee is the sustenance of life. Not only does it taste great, there is much research showing the health benefits of coffee. Unfortunately coffee is thought to contribute to digestion issues such as heartburn, acid reflux and indigestion for some people. If you suffer from pesky digestion issues it may still be possible to enjoy a daily cuppa by switching to the lowest acidity coffee. 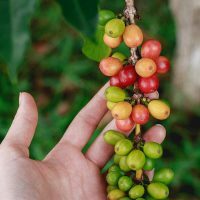 What Makes Coffee Low Acid? First, what exactly do we mean by coffee acidity? Acidity can mean two different things. PH level is what we all know from doing basic chemistry at school. The lower the PH level the more acidic something is. So drinks like orange juice and soda come in at around a 4. Water is right in the middle at 7. Coffee acidity ph tends to fall in the range from 4.5-5.5. So you will notice that coffee, while more acidic than water, is far less acidic than juice or some sodas. Many low acid coffee brands highlight the PH level of their coffee beans. While not the most important factor, it is one way of comparing acid in coffee. The more common interpretation of coffee and acidity is to do with the flavor notes in coffee beans. This is also known as brightness, tartness, aroma, bitterness – basically what makes coffee, well coffee. Coffee is made up of over 30 different organic acids. These acids combine to produce the unique flavor attributed to coffee. They are also responsible for many of the benefits of coffee such as antioxidants. 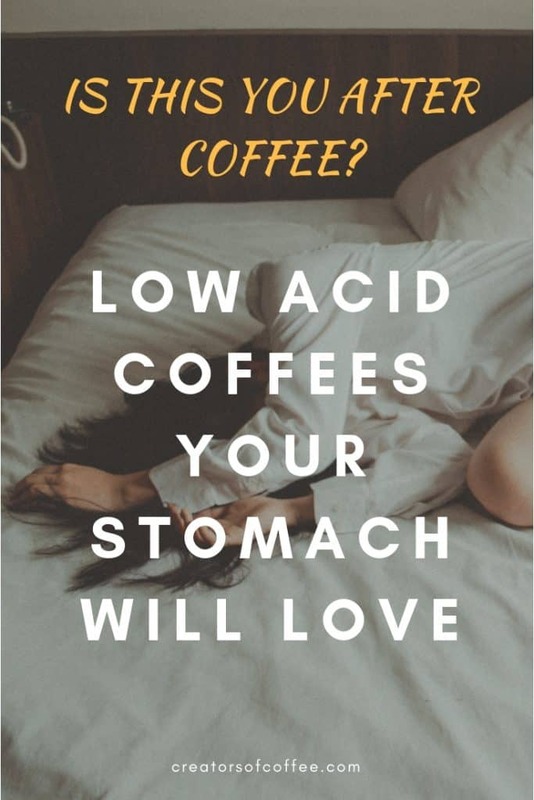 However it is some of these organic acids that are thought to link coffee and acid reflux. Two particularly troublesome compounds seem to be chlorogenic acid (which gives coffee its brightness) and caffeine. So when we talk about low acidity coffee it is the flavor notes we are really talking about. 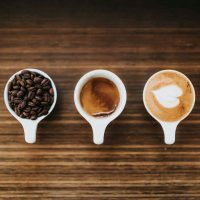 While some beans are naturally low in acidity, the roasting process and brewing method also have a big impact on the overall acidity of coffee. Let’s explain these to better understand what produces acid in coffee. The region and climate where coffee beans are grown has a big impact on the level of acid in coffee. Coffee beans grown at higher elevations tend to have higher levels of organic acid and caffeine. A good example of this fruity brightness can be found in Ethiopian coffee. This is quite different to coffee grown at lower elevations which tend to have a smoother and mellow flavor. Many naturally low acid coffee beans come from medium to low elevation regions such as Indonesia, Central America and Brazil. Wet processing methods tend to result in a higher level of acidity. Dry processing methods (more common in hot climates such as Africa) tend to produce much lower acidity. The roasting process has a big impact on the level of coffee acidity. Coffee bean acidity changes during the roasting process. During roasting the natural acids in coffee beans are broken down and change. An increase in the level of N-methylpyridinium (NMP) which is thought to suppress the release of gastric acid. 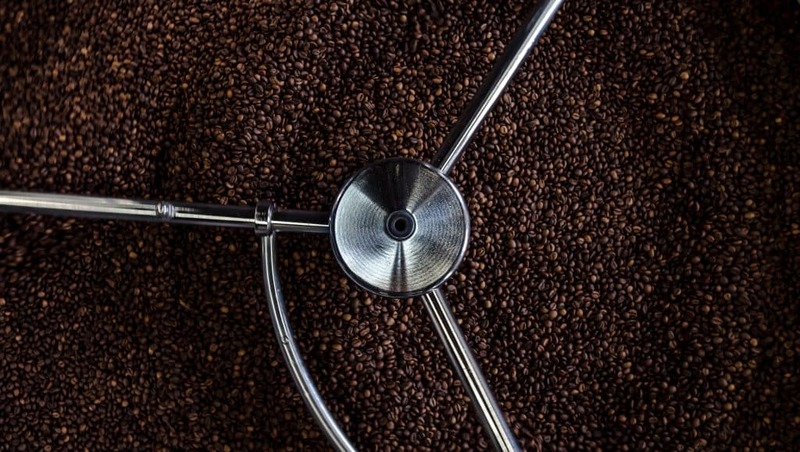 Some companies now use proprietary roasting methods to achieve low acidity. This often involves steaming or slow roasting the beans. These methods reduce the release of acids that occurs in high temperature roasting. Unfortunately this can also impact the complexity and overall flavor of the coffee beans. When coffee is extracted through a high temperature method, such as an espresso machine, chemical reactions occur that may increase the acidity of coffee. So one way you can reduce your coffee acidity is to try immersion brewing methods. French Press, Chemex and cold brewing methods tend to release less chlorogenic acid and caffeine. If you are a fan of french press coffee we list our favorite coffee beans here. 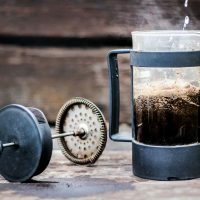 In fact cold brewing is thought to produce up to 70% less acid that hot water brewing methods. 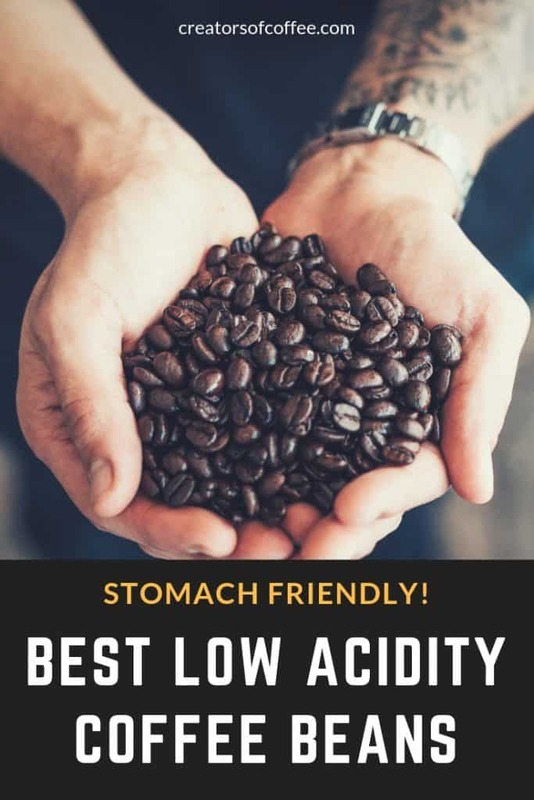 So as you can see, there are a number of factors that contribute to the lowest acidity coffee. However if you can start with the right low acid coffee beans you are well on your way to brewing low acidity coffee. 8 of the best low acidity coffees grouped by roast. All coffees listed are for whole beans but most of the low acid coffee brands offer ground beans too. Whilst not advertised specifically as coffee with low acid, the Sumatra Mandhaling from Volcanica Coffee is naturally low in acid. Sumatra is a region in Indonesia known for high quality, smooth tasting coffee. On top of that they are USDA Organic, Fairtrade, Rainforest Alliance and shade grown certified. Volcanica have achieved the ultimate objective of producing a naturally low acidity coffee without sacrificing flavor. 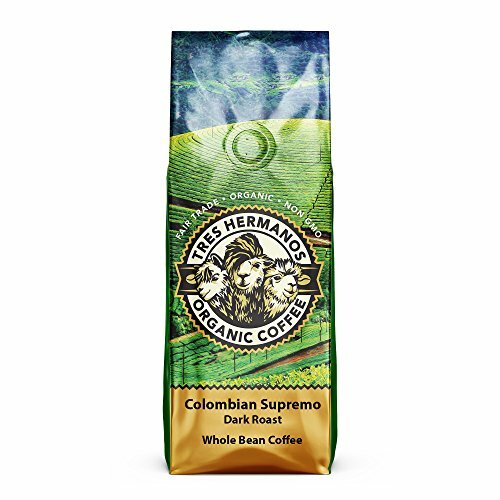 This is a great choice if you like to drink black coffee. Flavor Notes: Smooth, chocolate, earthy flavour with a full body taste. Size Options: Choose between whole bean or ground coffee in a 16 oz bag. Click here to read more reviews and check the price. Organic and Fairtrade certified, this company evolved from the needs of coffee drinking pregnant women and new moms. Free of chemicals, with low acid and with a choice of caffeine levels it is the perfect choice. Not only for new moms, but for anyone seeking a gentle coffee blend. They offer four caffeine levels to suit – low acid decaffeinated coffee, ¼ caffeine, ½ caff and full caff. Their proprietary roasting method extracts harmful acids to deliver coffee with a reported 60% less chlorogenic acid than other brands. 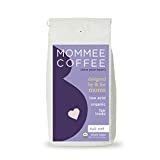 This makes Mommee Coffee worth a try by anyone who suffers reflux, not just pregnant women. Size Options: This coffee comes in whole beans or ground in a 12 oz bag. 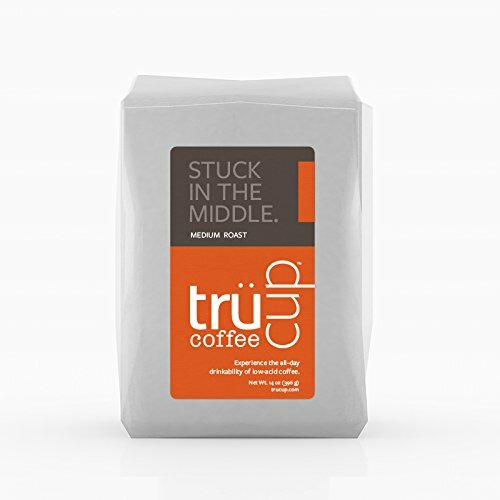 TruCup have one mission – to produce low acidic coffee that is drinkable and delicious. Their proprietary roasting process uses water and steam to remove the harmful acid. Their light roast has been measured at a PH level of 5.74, which is up to 4.6 times less acidic than other leading light roasts. Their medium and dark roasts will have a higher PH level again. They are not yet as popular as other brands, but with a single focus on low acid coffees we suspect they will only grow in popularity. Flavor Notes: Earthy and full bodied. Size Options: This coffee comes in drip, espresso and french press ground beans as well as whole beans. It is available in 14 oz, 2 pound and 5 pound bags. They also offer K cup low acid coffee. Check out the latest prices and more details here. Lucy Jo’s is a a family run business from upstate NY. 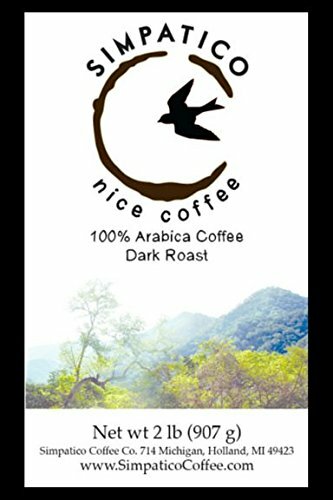 Their organic low acid coffee uses 100% Arabica beans. They offer a range of low acid blends including their most popular, the Mellow Belly Low Acid Blend. The PH level isn’t listed, but their beans come from Indonesia and Brazil. These are areas renowned for producing naturally low acid coffee beans. You can be confident their coffee beans are gentle on the stomach. Lucy Jo’s have a number of low acid blends including Organic Brainstorm and Organic Sumatra. Why not try them all and find a favorite. Flavor Notes: Smooth, sweet and earthy. Size Options: Available in both ground and whole beans in 11 oz bags. Click here to see more reviews of Lucy Jo’s Coffee. These low acid organic coffee beans by Java Planet tick a lot of boxes. USDA Organic and Fairtrade certified plus bird friendly, they are naturally low acid arabica coffee beans from Colombia. With a full bodied flavour and the roasting date printed on every pack, you can be confident you are getting fresh roasted beans every time. They offer a range of organic single origin and blends as well as subscriptions. They even offer green beans if you are a home coffee roaster. Flavor Notes: Smooth and full bodied. Size Options: Java Planet offer their beans in 1 and 2 pound bags plus sample packs. Click here to see the latest prices for Java Planet. 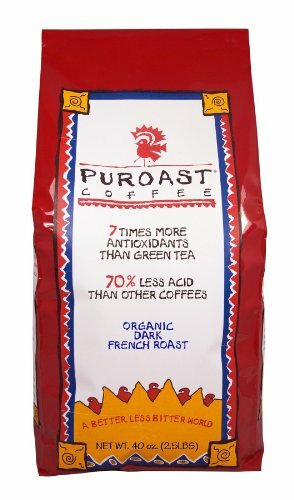 Born in the foothills of Venezuala, Puroast is one of the leaders in low acid coffee. Their organic low acid coffee is attributed to their roasting method. Beans are slow roasted over a wood fire to produce coffee with 70% less acidity and 7% higher antioxidant levels than other coffee brands. This makes Puroast low acid coffee a good choice for sensitive stomachs. The blend is smooth but the flavor may lack complexity for some. Unfortunately this is often the trade off for low acidity coffee. Puroast offer a range of low acid roast styles for drip and espresso. Flavor Notes: Balanced, smooth, light bodied. 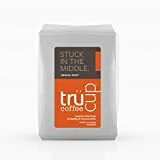 Size Options: Available in ground or whole bean 12 oz and 2.5 pound bags plus low acid coffee k cups. A more unusual option, Tieman’s Fusion Coffee is 100% Arabica beans blended with Matcha green tea, rooibos red tea and goji berry powders. While this is not a traditional coffee blend, it offers 5 times the daily antioxidant requirements. Plus the goji and rooibos help with digestion. The Matcha green tea provides a slow release of caffeine, so you shouldn’t experience the normal “jitters” of other coffee brands. Tieman’s offer decaf and medium roast options too. 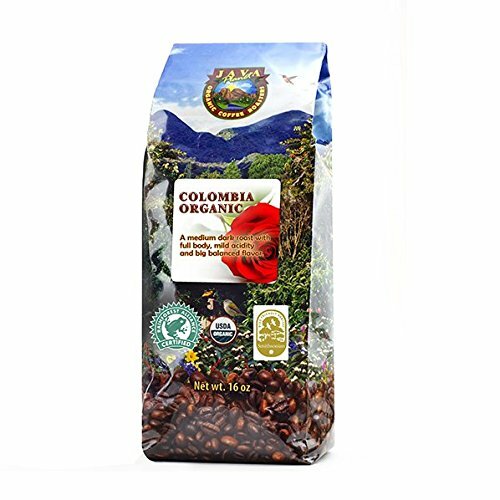 It is certainly a unique coffee blend, but may not be appreciated by coffee purists. Flavor Notes: Bold and smooth. Size Options: Available ground or whole bean in a 10 oz bag. 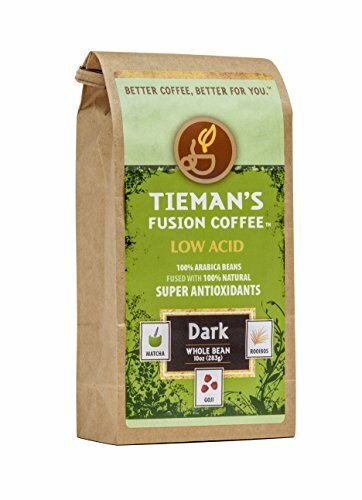 Find the best prices for Tieman’s Fusion Coffee here. 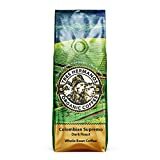 Fairtrade organic low acid coffee from Colombia. Their patented air-roasting process removes 80% of the acidity and sourness in the coffee beans without losing the bold dark roast flavour. This reduced acid coffee is roasted in small batches to maximise freshness. Size Options: Available ground or in whole beans in 1, 2 and 5 pound bags. Check out the options and latest prices here. Simpatico Coffee is known to have some of the lowest acid coffee in the world. The beans are grown in the wild in Oaxaca, Mexico then roasted in the energy efficient Revelation roaster. The beans are shade grown and are naturally low in acid. While not certified USDA organic as the coffee beans are wild grown, all growers have committed to be pesticide and herbicide free. Simpatico offer a range of low acid decaf coffee plus medium and dark roast styles. Flavor Notes: Smooth and robust with chocolate aromas. Size Options: Beans are available ground or whole in 2 and 5 pound bags. Choose an organic dark roast as these are considered to have the lowest acidity and are gentlest on the stomach. Choose single origin whole beans from low elevation regions known to grow lower acidity beans. Look for Indonesia (Sumatra), Central America, Brazil and Hawaii. For the ultimate treat try Kona Coffee beans. If lactose intolerance isn’t an issue then try adding milk to your coffee. Milk is thought to reduce the impact of coffee acid on consumption as calcium offsets acidity in the stomach. As a last resort consider adding an acid neutraliser treatment to your favourite brew. Popular coffee acid reducers include Coffee Tamer and CalciBlend. Try a different brewing method such as cold brew or chemex to lower overall coffee acidity levels. Preparing a cold brew coffee is very simple and cheap when using a customised mason jar like this this one or brew it in your french press!